In a circle, a radius perpendicular to a chord bisects the chord. In a circle, a radius that bisects a chord is perpendicular to the chord. In a circle, the perpendicular bisector of a chord passes through the center of the circle. 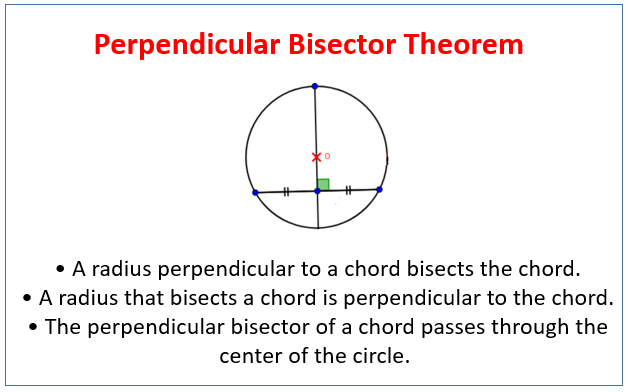 The following diagram gives the perpendicular bisector theorem for the chords in a circle. Scroll down the page for more examples and solutions. 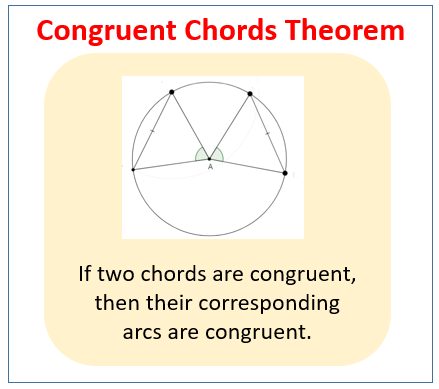 In a circle, or congruent circles, congruent chords have congruent arcs. (converse) In a circle, or congruent circles, congruent arcs have congruent chords. The following diagram gives the theorem for congruent chords. Scroll down the page for more examples and solutions. If a diameter is perpendicular to a chord, then it bisects the chord and its arc.